In addition to Memorial Day, today is the 60th anniversary of the horrific Blackwell, Okla. and Udall, Kansas, tornadoes that killed 102. The F-5 damage and the human toll was so great that people who lived through it and the rescuers can hardly talk about it to this day. There was no warning of either tornado. Unfortunately, I can't spend time on the anniversary because I want to provide essential information to my readers about today's major severe weather threats. 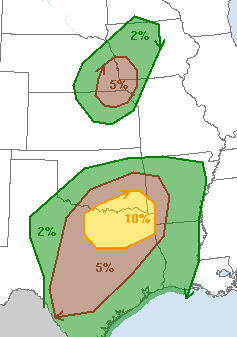 Scroll down for information on the tornado watches in Texas and the continuing flood threat. 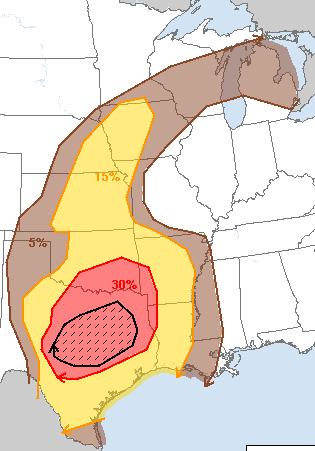 For the rest of today and tonight: Here is the tornado threat. Remember, 5% (brown) is the significant threshold. The significant threshold is 15%. Where you see hatching, gusts above 75 mph are forecast. The significant threshold is 15%. 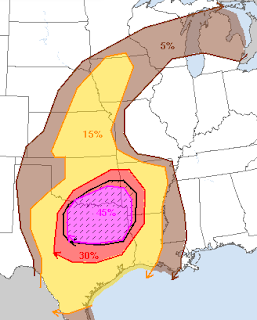 The hatched area is where hailstones more than 2% in diameter are expected. Be prepared to take shelter when storms approach. Make sure friends and relatives are aware and that dependents can reach shelter quickly. Move lawn furniture, trampolines and automobiles indoors/garage. If you live in a flood-prone area, be prepared to move to higher ground at the first sign of rising water. Whatever you do, do not try to crossed flooded areas by foot or by car. I will provide a couple of additional updates this afternoon.